SALT LAKE CITY, UTAH – April 29, 2015 – Monnit Corporation (Interop booth #954), a leading provider of wireless monitoring and sensing solutions for commercial and industrial clients, today announced the establishment of its Business Partner Program. The program details products and services offered to those wishing to partner with Monnit as either value added resellers, system integrators or OEMs to bring the power of the Internet of Things to a wide range of companies and organizations. Monnit’s current product offerings include more than 50 different wireless sensor types, wireless control and robust, reliable wireless gateways that are available in commercial and industrial platforms. Monnit enables users to remotely monitor information and activities such as temperature, access, presence of water, light, humidity, vibration, movement and much more. The products are accompanied by a secure, cloud hosted monitoring software which aggregates sensor information into an easy to use interface and sends notifications via text, email or voice calls if user-defined conditions are met or go outside set parameters. Monnit products are available to business partners as either Monnit-branded solutions for direct resale or as private-label products, allowing partners to sell the solution as their own. For more information on Monnit’s Business Partner Program, call (801) 561-5555 or visit www.monnit.com/partner. Salt Lake City, Utah – April 02, 2015 – Monnit Corporation (www.monnit.com) today, announced the release of new wireless duct temperature sensors. 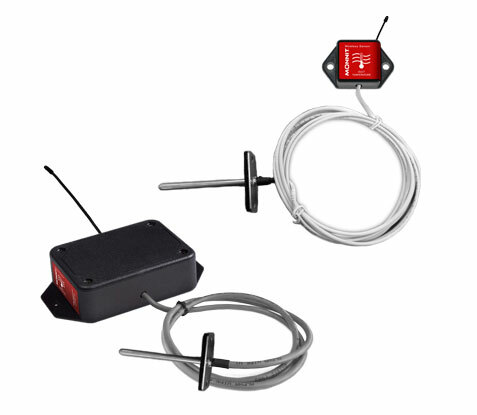 The wireless duct temperature sensors uses an NTC type thermistor with 8 ft. UL listed plenum cable to accurately measure temperatures in duct work, while maintaining a sealed environment. The sensor will measure temperature in the duct work and send data to the iMonnit Online Sensor Monitoring and Notification System. The data is stored in the online system and can be reviewed and exported as a data sheet or graph. User customization allows you to set notifications and alerts from the system so you can know immediately if temperatures are above or below an optimal range. The sensor probe features mounting flanges and can be easily installed for long term use. – Probe temperature range of -40°C to +150°C (-40°F to +302°F). – 8 ft. UL listed plenum cable. Salt Lake City, Utah – April 02, 2015 – Monnit Corporation (www.monnit.com) today, announced the release of new wireless pressure sensors. 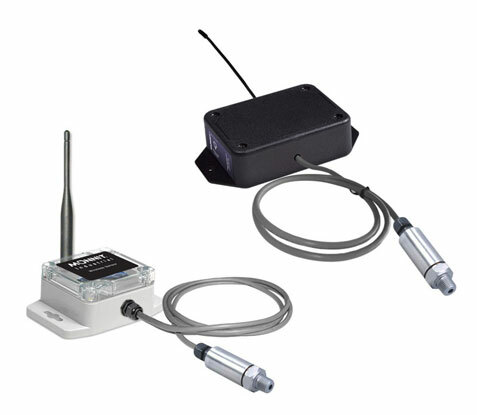 The new wireless pressure sensors can measure pressurized gas, liquid or vapor from 0-300 PSIG using a 5 volt pressure transducer. By connecting the wireless pressure sensor to a pressurized supply line, it can measure the pressure and send data to the iMonnit Online Sensor Monitoring and Notification System. The data is stored in the online system and can be reviewed and exported as a data sheet or graph. User customization allows you to set notifications and alerts from the system so you can know immediately if pressure is above or below an optimal range.